The Internet is broken. Browsers are gaping holes in our security frameworks. Certificates are becoming a liability as cyber-criminals or certificate authority negligence weakens our trust in the process. If we continue to see defense only in terms of preventing the bad guys from getting to our end-point devices, we will surely lose the security war. The answer is to shift perspective. First, it’s important we assume that every end user device is potentially infected. Further, we must assume that one or more of the servers in our data center are infected at any point in time. This might not be true for all organizations, but it is a smart baseline assumption. Once we accept that we are vulnerability and likely infected, it is easier to begin supporting preventive controls with comprehensive methods to identify, contain, and manage inevitable breaches of security: SIEM, NetFlow, and response. Over this and the next two articles, I will take a high-level look at each of these breach-control methods. Further, I will provide links to resources providing detailed information about how to design and deploy them. SIEM (security information and event management) is a comprehensive approach to assessing system and network behavior. It requires collection of logs from various devices across the network, including firewalls, IPS/IDS, servers, and switches. The graphic below depicts a very simple SIEM architecture. Logs collected by each device are sent near-real-time to a Syslog server. “Syslog is a standard for computer data logging. It separates the software that generates messages from the system that stores them and the software that reports and analyzes them” (“syslog”, 2013). This is known as log aggregation. Aggregated logs are sent to a correlation server for analysis. The correlation server looks at all events received from across the network and attempts to mine attack patterns or other anomalous behavior. Anomalous behavior identification is only effective if the SIEM solution is properly tuned. In other words, the correlation server must know what patterns are normal for your network and which fall outside alert thresholds you set. For more information about correlation in general, see event correlation at wikipedia.org. All relevant information is usually available via a portal. 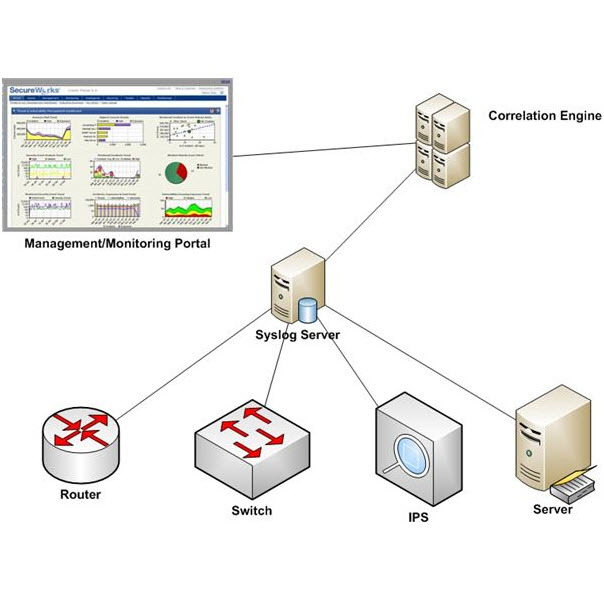 For example, a SIEM management server might post updated correlated results every five to 10 minutes. Events meeting criteria set by you can also cause alerts to be sent to administrators and security personnel via SMS, email, etc. Logs can tell us a lot about behavior, but they fall short of providing insight into how data is actually moving across the data center or across our network segment boundaries. This is the topic of the next article in this series: NetFlow (IPFIX). Policy is not enough. Ensuring sensitive information is handled in accordance with internal policy and regulatory constraints requires monitoring of all activities associated with it. In other words, inspect what you expect… continuously. Further, too much reliance on human behavior is a recipe for security disaster. This week, we learned that the University of Michigan Health System, via a vendor, lost about 4000 patient records. The vendor, apparently authorized access, copied patient records from a database to an unencrypted device. The device, left unattended in a vehicle, was then stolen. Sound familiar? It should. This scenario appeared many times in news articles over the last several years. While the players differed, the gaps leading to the losses were largely the same. This set of conditions is growing more common. They are strengthened with an increasing number of devices filling the role of insecure mobile data storage, as the BYOD (bring your own device) phenomenon continues to complete its hold on business operations. Managers and business owners who believe they can simply write a policy, train employees, and move on to the next challenge are kidding themselves. So what can we do to protect ourselves from becoming the topic of yet another subject in an article about mobile data loss? Plenty. As BYOD expands the corporate attack surface, policy-based access controls augment the steps listed above. By default, do not allow anyone to copy data to a mobile device that does not meet policy requirements for data protection. Policy-based controls authorize user access based on user role, the device used, the location of the user/device, the data and processes accessed, day of the week and time access is requested, and the device’s compliance with security policy. All of this is automated, preventing reliance on human behavior to protect data. Again, policies are not enough. Without technical controls, they rely on human behavior to protect data. This is a bad idea. Instead, implement technical controls as far as is reasonable for your organization, and then monitor for compliance to ensure people, processes, and technology are producing expected security outcomes.